One year ago, today, at 1:30 in the afternoon. Lettie and I had an appointment. The fight had ended. We fought well for two years to keep her as healthy as possible. It's probably safe to say that the last six months of Lettie's life were because of my stubbornness and unwillingness to let go. Maybe longer, I am not sure. I had an appointment with the Vet a couple days before. She had had what we began to call An Episode. Chronic Renal Failure was taking its toll, and every time she would have An Episode, we would know it because she would fall over. She was weakened by the disease and our inability to convince a very feisty dog to eat what she needed to keep herself up to speed. I eventually became something of an expert at syringe feeding my dog. It really is something anyone can do, if you set your mind to it. The treatment in a human would be a kidney transplant. They don't generally do that for dogs, because in our society we don't value them as highly as a person. The treatment for a dog is to flush them with water and give them as much food as they will take. Then feed them more. We visited the Vet. She was a dog who began to hate going for a ride. This was the same dog who rode down here in my Jeep curled into a Dog Ball in the front seat. I had the roof off of the car and stubbornly left that roof off when I drove through a thunderstorm near Fort Pierce, FL on I-95. People looked over at us and scratched their heads as I wiped water from the inside of the windshield. Lettie took it in stride and left a dog ball shaped dry spot on her seat. When I looked down at her and said "Well, that went well", I could see it in her eyes as if to say "you're crazy". She had also saved my life once when I fell asleep at the wheel. A dog who just enjoys the ride gets very predictable and eventually learns the rhythm of the road. When that same dog realizes something is very wrong, the nose goes under the arm and violently lifts it until you wake up. I'm not superman, and marathon trips are not a good idea. That next to last visit, they flushed her out with fluids and took blood samples. I came home with her on that Friday and waited for the results. Monday I called back and the desk said they were available. I brought her in and we sat waiting for the Vet. Not good news. We tried another day of flushing but it was obvious that she did not have this in her for much longer. Tuesday morning I came back and spoke with the Vet again. Tears in my eyes, I said "I think it is best that we discontinue treatment". At that point the staff poured out of the back rooms knowing it would be the end. We knew it already and had found someone to help her cross over. "To Cross Over The Rainbow Bridge". I had another two days. Everything was scheduled and went without a hitch. I was warned that "They Know". I was told "She will look at you when it ends". That is exactly how it happened. There was a large white towel in front of the big green chair that she used as a mat in the corner of the room. I wanted her within reach that last day. When everyone arrived, I held her paw for that trip. The injection of pink goo went quickly. It was a double shot. One to make her sleep, another to finish the job. Every time I hear "Lethal Injection" I think of this. She did look into my eyes at the end. Eyes closed and she slowly relaxed and went still. It was rather surreal and a bit unbelievable to me until they carried her out. The head lolled over the edge of the blanket and since nobody was in the house, I was able to finally let my feelings out. My mantra for the next few weeks was "I want my girl back". After all was said and done, I gathered up her belongings. We were not going to get another dog just yet. Some of the items went across the street to Ellie. All but that one last half gnawed chew. It was on the fllor and got pushed under the big green chair and hidden for a while. That's in the frame with Lettie's dog tags and one of her paw prints. The other paw print has her collar, still with the final dog tags on it. 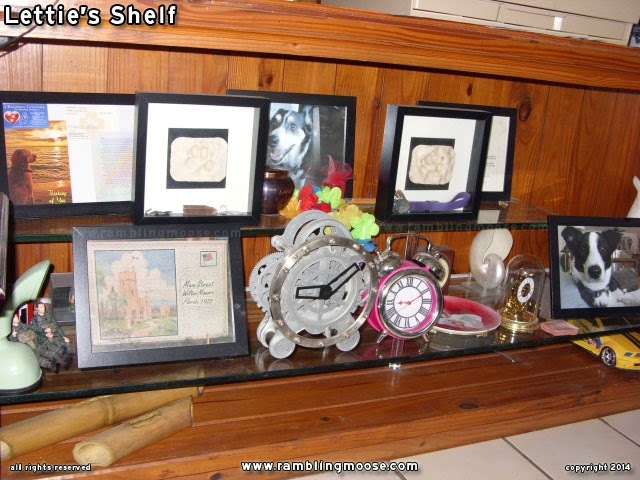 Her ashes are in a brass urn under her picture on the top shelf. There is a third paw print that will go with me into the bedroom under her picture in there in a Place of Honor. I have a picture of a street fair in Chestnut Hill, Philadelphia, PA where I was giving her a snack years ago. A passing photographer liked the shot and it got into the paper. I'm fortunate to have that memory. The paw prints sat around for a good long time before I finally could bring myself to begin to put things together. We bought the frames, and they sat. The paw prints are a salt dough that had hardened in the oven, and I finally sprayed them with a plastic clear coat. Glued to the hard cardboard backing with silicone tub caulk, then sealed with the dog tags, collar, and chewie. Her original leash is behind my bedroom door with her harness on a hook. That is its place. I see it whenever I run the vacuum cleaner, which is frankly not often enough. Lettie is still here, in spirit. She has her place. She had a rough start and the trip here was not easy. She was Yet Another Owner Abandonment. That happens far too often with high energy and intelligent breeds like the Mostly McNab Mix that she was. She spent six months in a rescue in North Dauphin, PA, near Harrisburg. I was told "watch her, she's feisty and has a lot of energy". That energy would serve her well. All the way to her last day and that last moment when she looked up at the indignity of the first shot. Settling down to sleep at my feet, to this day is the view I have in my mind when I look at those square tiles on the floor, even one year later.